If the 2019 Jeep Wrangler near Denver was a presidential candidate, it would win the election. Its boxy, yet popular exterior is forthright enough to win the hearts of commuters, but it’s rugged enough to please off-roaders and weekend warriors. While the new Wrangler is retro, it goes further than that. All of Jeep’s signature design elements are there: the squared-off shape, seven-hole grille, fender flares, and round headlamps, but everything’s been improved. The 2019 Wrangler’s grille tilts rearward at its top, in a brief nod to the old YJ. The tailgate has a handsome side-hinge door, which is surprisingly practical. Why buy the 2019 Jeep Wrangler? We’ll show you at our dealership. The word “compromise” isn’t part of the vocabulary for the 2019 Jeep Wrangler. Although it’s known for its off-road readiness, it’s equally capable as far as interior storage and comfort are concerned. The cabin is clad in cloth or available leather coverings, and that upholstery will stand up to whatever you throw at it. The front seats are comfortable and supportive, and the rear seats are quite roomy, with 35.7″ of legroom in two-door models. All versions of the 2019 Wrangler have great cargo room as well. With both seating rows in the upright position, the new Wrangler two- and four-door models have almost 32 cubic feet of cargo area. With the second row folded down, you’ll get over 72 cubic feet of cargo room. The dash is low, which increases outward visibility and opens up the cabin. Controls are easily reachable, which will please most drivers. Why buy the 2019 Wrangler? Stop by our dealership serving Denver Thornton Boulder to find out! We’d recommend the Sport S. It’s full of all the features you’d expect, including air conditioning, power locks, keyless ignition, remote entry, and a 5.0″ infotainment display. The Sport S version answers the “why buy” question quite well, and its multiple options include a heated steering wheel, heated front seats, active safety gear, and remote start. The Sport, the Sport S, the Sahara, and the Rubicon trim levels of the 2019 Jeep Wrangler all come with the same 3.6L V6, which is mated to a six-speed manual transmission with four-wheel drive. The eight-speed automatic is a popular option, and we recommend considering the 2.0L turbo four-cylinder for its increased fuel efficiency. Stop by and we’ll show you why buy the 2019 Wrangler. With the 2019 Wrangler, you’ll have refinement and off-road readiness. Most new Wranglers will get the aforementioned 3.6L with the automatic transmission. While the 285hp V6 is enough for around-town driving, we suggest the 2.0L turbo four with a mild hybrid system. It’s rated at 270hp, but its slight horsepower loss is made up for by its smooth shifting eight-speed automatic. The mild hybrid system keeps accessories running at idle and it allows the engine to take a breather on long trips. However, it may not be enough grunt to get the beefy Wrangler moving. Both engines can tow up to 2000 pounds (for the two-door version), or 3500 pounds for the four-door. Coil springs absorb the road’s bumps, and the Rubicon’s 33″ tires make the ride even smoother. 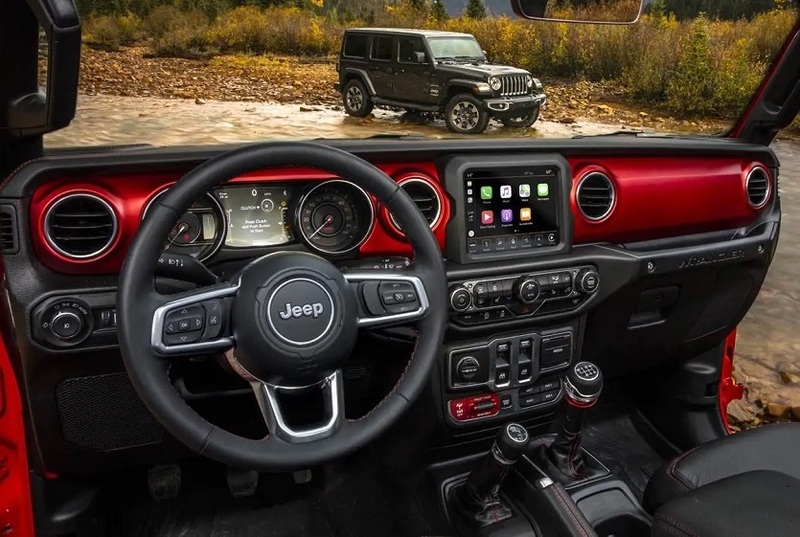 The steering system on the 2019 Jeep Wrangler near Denver offers enough feedback to keep you connected, and it tracks straight as well. Come by today to find out why buy the new Wrangler. At the time of this review, we haven’t yet received crash test ratings for the 2019 Jeep Wrangler. Although its looks have not changed much since last century, its list of safety features has. Along with the optional blind spot monitoring and parking sensors, you’ll get available adaptive cruise control and forward collision warning. There’s a standard rearview camera, as well as four airbags. Somewhat surprisingly, auto emergency braking isn’t available on the 2019 Wrangler. However, we still believe it’s a safe choice for you and your family. Why buy the 2019 Jeep Wrangler? We can show you. With its rugged good looks, comfortable and roomy interior, and long history of off-road readiness, there are many reasons to buy it. Whether you need a spacious family hauler or a capable weekend getaway vehicle, the Wrangler has you covered. Call us for more details, view our inventory on our website, or come to our dealership serving Denver Thornton Boulder to take a test drive.